Soffit and fascia products from ABC Seamless of Albuquerque give homes in New Mexico an attractive, cohesive look that can increase curb appeal and even add value. Just like our durable house siding, these products are seamless, customizable, and maintenance-free. Adding our soffit and fascia to cover your home’s overhangs and roof edges can provide a classic, decorative final touch. And because these products are crafted on-site at your home by highly qualified technicians, you can be sure they’ll be fitted to the precise measurements of your home for a beautiful, harmonious look. Durability – We install products manufactured using 28-gauge, hot-dipped, G-90 galvanized steel, a material stronger than any aluminum or vinyl product on the market. These products are designed to withstand the harsh weather conditions that can sometimes affect the Albuquerque, NM, area. 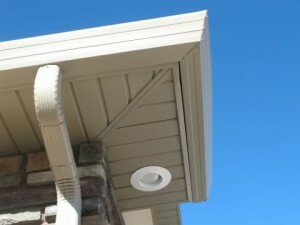 Exceptional strength – Unlike some companies, we never staple soffits or fascia panels onto homes. Instead, we screw them in place for unbeatable strength, enabling the products to resist even the strongest winds. Attractive appearance – With numerous color options available, you’re sure to find the perfect colors to complement the rest of your home for a cohesive look. Furthermore, you can depend on ABC Seamless of Albuquerque professionals to arrive on time at your home to provide courteous installation services. All of our factory-trained technicians are fulltime employees who are committed to delivering exceptional workmanship. Plus, all of our products are backed by a lifetime, non-prorated, transferrable warranty that covers labor and materials, which means in the unlikely event that there is ever a problem, we will send one of our qualified technicians to take care of the issue to your complete satisfaction. To learn more about the difference our soffit and fascia products will make on your home in Albuquerque, NM, contact ABC Seamless of Albuquerque today. We encourage you to visit our showroom or call to schedule a free, at-home consultation.